1st: 8-9/7-2/5/1-3-4…A wide open affair to open today’s racing action, and I will flip a coin. Maybe. I will go to the outside in this 5.5-furlong grass event and give the edge to Desert Image (8). Trainer is having a solid meet, winning with .20% of the 142 starters to date. This one comes off a second, beaten only a nose, at this same level on Dec. 7 here. That was a drop in class from the time before, when she gave it all until losing ground at the end. Winner of the races two back and three back both came right back to win. Facing tougher. Ain’t Annie Grand (9) is an Iowa-bred, and that doesn’t fire me up any. But this one ran a head behind our top pick last time out. Has hit the board in four in a row. May be able to scratch out another placing. I bet the 8 to win/place/show and then box the 8-9 in one exacta. I will key the 8 over/under the 9-7-2-5 in two smaller versions. 2nd: 5-2/3-4-6/8…This is a nice MCL event for $50,000 price tag. Will be contested at 11/16-miles, and I give the edge to Cashanova (5). This one could have been a winner last time out if not for some serious traffic issues late. Was moved up to second after a DQ, and that is writing it mildly. Was bumped hard in the stretch, and then had to check up sharply late in the going. Gets a new rider today, but he has won with 2 of 4 for this barn in the last 60 days. A cleaner trip may be the ticket today. Bring the Dough (2) and Lemon Again (3) both drop out of the MSW group to the MCL ranks for the first time. The former goes for a barn that wins with .21% of those dropping down for the first time. The latter goes for a barn that hits with .17% of those routing for the first time and .15% of those racing for the second time. I bet the 5 to win/place/show and then box the 5-2-3 in one exacta. 3rd: 4-6/1-8-9-5/2-3…The second of the grass races carded today in New Orleans, and I will give a slight edge to Pont du Gard (4). This one ran in three Graded Stakes events last year, and now will drop back into the optional claimer for just LA-breds in this spot. Second time out for this barn, and my good friend Louie Roussel hits with .24% of those making the second career outing for him. Also scores with .26% of those making the second start off a layup. Work on Feb. 3 was nice and this one has the look of being awfully tough in here today. After all, ran second in the G3 Arlington Classic last year. Gladyousawme (6) has run the last two against open company and had a third two starts back. Before that, this one did well against LA-breds only. Works here have been lights out for the meet’s top trainer. Gets a new rider today, and the jock won on him the only previous time they hooked up. The one to beat. I bet the 4 to win/place/show and then box the 4-6 in one exacta. I will key the 4-6 over (only) the 1-8-9-5. 4th: 1-2/7-6-4-3…A nice optional claimer here, and I will go with Blue Collar (1) in this spot. This 5YO mare is dropping all the way from $35,000 to the $17,500 price tag today and will be converting back to the dirt after three tries on the grass. Won the race at Churchill Downs two back easily against much tougher. Gets that rider back in the irons for this one, and the barn hits with .23% of those making this surface switch. Love the work here on Jan. 28. Looks the best, and the rail is winning at a .22% rate at this distance. No Cacha Na (2) is trained by the talented and affable Tom Amoss, who is having a super nice meet here. Has won with .23% of the 70 starters to date. This one has hit the board in 10 of 17 lifetime starts and three in a row. Meet’s top rider back in the irons. Should be tough stalking the pace. I bet the 1-2 across the board and then box those two solidly in one exacta. I will key the 1-2 over the rest of the numbers listed in a much smaller denomination. 5th: 1-6-4/2/5…Shantel Lanerie Memorial Stakes…What a wonder Stakes event added to the card in honor of one of the nicest people to ever grace a racetrack with her presence. She may have lost her battle with cancer, but she left an impression, a style, and a smile with everyone she met. She won at life. Today’s race is full of winners, just like the wonderful lady it is named after. A terrific field. And, it would be amazing if her husband, Corey Lanerie, could win it, as well. He will be riding Elsa (6) in this spot for the barn of Michael Stidham and the Godolphin LLC Stables. This one shipped West to win the G3 Jimmy Durante Stakes at Del Mar on Nov. 24 after having made the first three career starts on the East Coast. Won that 1-mile event in impressive fashion when getting treated with Lasix for the first time. Has been training terrific for this comeback race and won the career debut. So can run fresh. My pick. Red Rounder (1) should be fitter, having run here in the Ginger Brew Stakes on Jan. 5. Ran third in that one to a good one. Now, she makes the third start off a layup and shout be fit. Gets a top rider and the rail is hitting at an .18% rate. Liora (4) gets back to the turf, where she ran third at 1 mile at Churchill Downs in September. Ran behind Needs Supervision in the Silverbulletday last time out. Won the G2 Golden God before that. Has class. Winter Sunset (2) is probably the best bred filly in the race and is a perfect 1-for-1, having broke the maiden impressively here on Nov. 29. She is beautiful to look at and to watch. Can’t dismiss this striking gray by Tapit. I bet the 6-2 across the board and then box those two solidly in one exacta. I will key the 6 over/under all the numbers I have listed. 6th: 1A-5-4/6-2-7/3-1…A nice MSW event going the sprint distance of 6 furlongs, and I will go with the far outside post position and Coltonator (1A). Not the premier location to begin the race, but this one is likely to drop back from the pace setters and get a nice position to close late. Should improve with the second start off the layoff, and ran a nice second in both of the two events to date. Jockey and trainer have teamed up for a 2-1-0 record in the last 4 starts together. Box of Chocolates (5) is 5-2 in the ML for the career debut. Has been training well for a HOF barn and the rider is one of the best here, winning at a .20% clip. Dam of this one has a winer and 1 SW. Jockey/Trainer have teamed up for a 2-1-0 record in the last 3 starts. But this son of Candy Ride only cost $17,000 as a yearling. The sire stands for $80,000. What’s up there? Zapper Van Winkle (4) could be a surprise here. 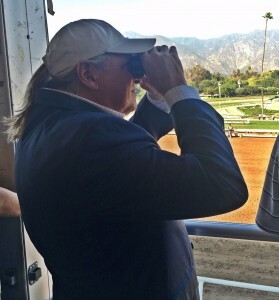 Working well for a hot trainer, who has 3 wins in the last 8 starts. Meet’s top rider takes the assignment, and this one is working well for the debut. Barn only hits with .02% when making the debut in MSW company — and that’s from a sample size of the last 48 to meet the standard. Longshot? Yes. But a chance? Maybe. I bet the 1A across the board and then box the top 3 numbers in the exacta. Wide open here. 7th: 11-5/1-2-6-9/(12)-7-8-(13)…This is a 11/16-mile contest over the sod, and I will go to the extreme outside for my top selection — despite the horrid post. Temple City Terror (11) flashed a ton of speed in the first start, when she drew the rail. That’s a tough post for a debut runner, as well. But she made the lead and faltered late when running a mile over a yielding track. Should benefit greatly from that race, and if she is able to use some of her speed to cut the corner nicely, then she made be OK. Worry about the outside post, but the meet’s top rider is up and the barn scores with .17% making the second grass start and .15% making the second start overall. Noble Fever (5) could be the horse to beat. Ran well when getting the grass for the first time here on Jan. 20. Apprentice rider gets the call again, and should stalk the leaders and have a chance to pounce late. Trainer hits with .22% of those making the second route race. I bet the 11-5 across the board and then box those two solidly in one exacta. I will key the 11-5 over the 1-2-6-9 in a smaller version. 8th: 6/1-2-4/5-3-1A…This is my first Key Play of the Day, and is the much-anticipated return of the very nice Tapit colt Dream Maker (6). This well-bred colt looked like a world-beater when the broke his maiden by 3 on debut at Churchill Downs last June. Broke dead last of 6 that day and came running like a jet plane to win by 3 easy lengths — going just 5.5 furlongs. Wow performance. Ran next in the G1 Hopeful Stakes at Saratoga and was 5th behind Mind Control. Green that day and was not able to match the same late strides. Was favored in the G1 Breeders’ Futurity at Keeneland on Oct. 6. Favored. Got a horrendous break from the gate and nearly went down when clipping heels early. Wrapped up on after that, as Knicks Go ran off to an impressive win. Knicks Go goes today in the Sam F. Davis at Tampa Bay. Dream Maker goes here. I think this one could return to form and favor with an impressive performance. Gets a new rider, which should help. I bet the 6 to win/place and then key the 6 over the rest of the numbers listed. More on the 1-2-4. 9th: 2-11/3-1-5/4-9-10/(13)…A very nice MSW event over the grass, and I will give the slight edge to Desert Rendezvous (2). this one ran huge here on Jan. 5 over a yielding sod. Came from the clouds to be second, and had all kinds of issues in the late going. A little experience, and this 3YO Hard Spun filly could be a tough out in this spot today. Barn hits with .24% of those returning as a beaten favorite, and with .13% of those making the second route race. This one ran third behind Winter Sunset (watch the Stakes earlier) two back. Could be her day. Tupelo Hon (11) draws poorly outside, but does have a second when running over the grass two back. Ran up against a real good one in there and the first out, too. Red Rounder is in the Stakes earlier in the card, too. I throw out the last one, when moved to the main track. Should be closing with a purpose late. Like the rider. Don’t throw out Gamblin Train (1) in this one. She did win one already, but was DQ’d. Ran third last time out when closing hard. I bet the 2 to win/place/show and then box the 2-11-1 in one exacta. I key the 2 over/under the 11-3-1-5-4-9-10 in two smaller versions.